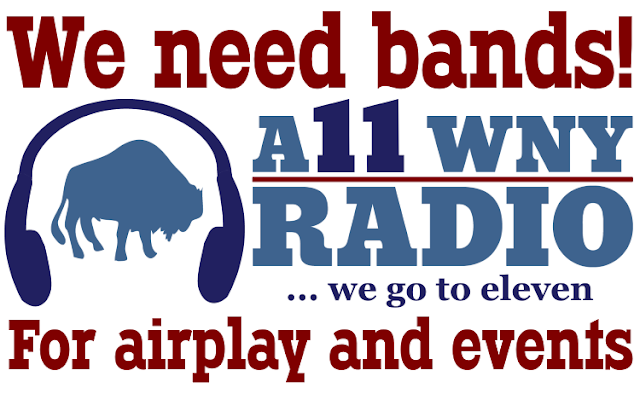 Home / allwnyradio / events / ThinkSoJoe / We need bands! Hey Western New York musicians: We need your help. All WNY Radio has gotten back into the event business with plans to host a live show at a local establishment once a month. We started with the 7th Annual All WNY Music Awards on Jan. 8 at Evening Star Concert Hall. Then we held the Blackened Heart Ball at Stamps on Feb. 12. And you may be aware of the All WNY Radio 11th Anniversary Party on March 25 -- also at Stamps. But we're one slot away from filling a show on April 11 in Buffalo and already thinking about May, June, July, and the months that come after. The opening on April 11 would best suit a rock band (no metal, no rap -- as per the venue) and requires all band members (and attendees) be 21+ with valid ID. After that, we're literally looking for any genre. We like to mix it up. To get in on the event action, hit up our event coordinator, ThinkSoJoe Kent on Facebook. We are also in need of new music. We always want new music. In fact, our goal is to play 365 new tracks this year on All WNY Radio. Again, any genre is great with us. For now, we mix it all up and put it on shuffle. In the not-too-distant future, we'll offer themed time slots for "office friendly" music, metal, rap, punk, live recordings and more. To submit a track or three, go to submit.allwnyradio.com. Feel free to contact All WNY Radio's program director, Scott Leffler, with any questions.